The U.S. Geological Survey described it as one of the greatest deposits of rare earth minerals in the world. This rare earth deposit is so massive that its discovery resulted in the identification of five previously unknown minerals. In total, over 47 different minerals would be discovered to be present there — many of them found only in the world's most remote locations. The deposit was so phenomenally important in the time of its discovery that it was once owned by none other than Thomas Edison. The mineral wealth contained at Barringer Hill in Llano County, Texas was first revealed in 1887 when its owner, John Barringer, was doing some prospecting. 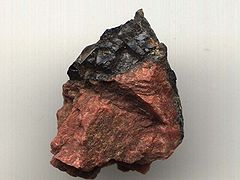 Barringer found an outcropping of a heavy greenish-black ore, and although he was not a geologist, he knew this rock was special. So Barringer collected several samples and sent them in to scientists in New York and Philadelphia for testing. A whopping 47 different minerals were present in the ore samples Barringer had sent in — five of which were totally new to science. The ore from Barringer Hill was like nothing geologists had ever seen. Gadolinite will glow when heated. This characteristic (called “pyrognomic”) was known to scientists prior to the discovery of gadolinite at Barringer Hill. But gadolinite was only known to exist in Russia and Norway. And it was outrageously expensive. So the discovery of gadolinite in Texas immediately grabbed the attention of Thomas Edison, who was looking to perfect the incandescent light bulb at the time. Edison hoped that testing could show gadolinite was a suitable material to be used as a filament in the light bulb. And in 1889, Edison's Piedmont Mining Company acquired Barringer Hill for $5,000 or $10,000 (sources vary) in gold. But by 1903, Edison’s company had experimented with the gadolinite and all 47 minerals found at Barringer Hill and found no good use for them as a filament in the incandescent light bulb. Just a few years later, the mine was closed. Edison's Piedmont Mining Company only conducted relatively small-scale mining operations for a short time. That means the mineral wealth at Barringer Hill is still relatively untouched. And there could be billions of dollars' worth of rare earth elements waiting to be mined. Barringer Hill is now laying 100 feet underwater. A few years after the Barringer Hill mine was closed, the land was acquired by the Lower Colorado River Authority, a public utility created by the state of Texas. The LCRA built a dam, redirected water from the nearby Colorado River, and flooded Barringer Hill and the surrounding areas to create a water reservoir called Lake Buchanan. Today, Lake Buchanan is surrounded by a quiet community of nice parks and privately owned cottages and houses, which are commonly rented out to vacationers and fishermen. So any hopes of getting to any of the rare earth elements out of the Barringer Hill deposit is a pipe dream. There are no official estimates of the rare earth resources contained at Barringer Hill. And the deposit has been underwater for some 80 years. So there's no telling how much rare earth treasure lies beneath Lake Buchanan. However, the presence of rare earth elements within the area has recently been proven — mostly to the West and into New Mexico — by exploration firms working in the region. Among them is a junior rare earth exploration company called Texas Mineral Resources. A recent economic assessment showed that this $5 million company could mine $7.9 billion over a 20-year mine line from its project, which is a seven-hour drive to the west from where Barringer Hill stood. Texas Mineral Resources is an exploration-stage mineral company. Its flagship project is the Round Top Mountain, located near Sierra Blanca in Hudspeth County, Texas — about 450 miles from the old Barringer Hill. Texas Mineral Resources holds 19-year renewable leases from the state of Texas on 950 acres encompassing the Round Top project and additional prospecting permits on adjacent areas covering an additional 9,345 acres. And a lot of the exploration work has already been done. After an extensive exploration process, Texas Mineral Resources completed a Preliminary Economic Assessment on the Round Top project in November 2013. This report showed Measured, Indicated, and Inferred Resources of 1.1 billion pounds of rare earth oxides. The Preliminary Economic Assessment shows that initial capital expenditures would be about $293 million dollars with a total gross revenue from mining of $7.9 billion over 20 years. The deposit is mostly above ground, allowing for simple open-pit mining. It's near a major U.S. highway (US I-10) and close to Southern Pacific and Missouri Pacific Railroads. The population around the project is low and electrical infrastructure is in the area. Texas Mineral Resources has not yet been able to secure the money. But it is working to show that Round Top is a profitable project. Back in May 2015, the company reported that light rare earth elements lanthanum and cerium were successfully recovered from the Round Top project. And a few months later in August, Texas Mineral Resources reported that it was able to successfully recover another rare earth element, scandium. These tests shows that a commercially-marketable rare earth concentrate can be produced from ore mined at Round Top. And this is something that not just Texas Mineral Resources needs, a new rare earth mine is becoming vital to the U.S. at large. There is currently only one rare earth mine in the U.S.
And it shut down in 2015. Back in August that year, Molycorp (OTC: MCPIQ) shut down its Mountain Pass rare earths mine in California (the only rare earth-producing mine in America) due to production issues and falling rare earth prices. As a result, the company filed for chapter 11 bankruptcy protection and put the Mountain Pass mine into “care and maintenance” mode. This means that the United States currently imports 100% of its rare earth demand. Meanwhile, we're in competition with countries like China where rare earth demand is expected to increase by 50% in the next five years. New rare earth deposits have been found around the world and are starting to be mined. However, all of them are a decade or more behind in creating an extraction and processing supply chain as robust as China's. Molycorp's bankruptcy has certainly deterred plenty of investors from rare earth elements. But despite their relative scarcity, rare earth elements have proved extremely useful in industrial applications and have paved the way for new advancements in technology. And with the ever-increasing importance of rare earths in modern technology, I still believe there is opportunity to be had in rare earth investing.